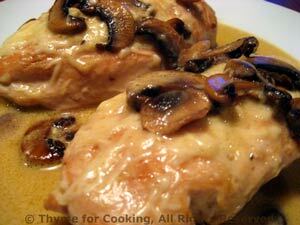 Chicken, Sherried Mushrooms, from Thyme for Cooking's Weekly Menu Planner. 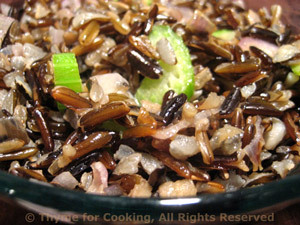 Browned butter adds a wonderful, nutty taste to vegetables. But, keeping in mind my desire for healthy foods, I use half olive oil... Feel free to use all butter. 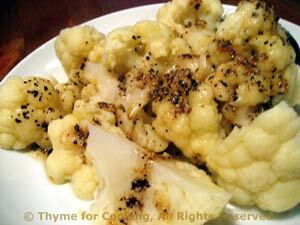 Cut cauliflower into pieces, put in steamer and steam over water for 15 - 20 minutes until fork-tender. Put butter into same pan and sauté until it turns light brown, being careful not to let it get too dark. Then add olive oil and pepper. Heat through and add cauliflower. Toss to coat, heat through and serve.